Owning a home or condo in Fort Collins gives you lots of sunshine -- about 300 days per year, and a place that regularly tops the national "Best Places to Live Lists". Being here, you will quickly find yourself sharing our outdoor life style and overall sunny postive community attitude. Creativity focuses this community on the best life has to offer. Colorado State University and the citizens of Fort Collins enjoy a wonderful town/gown synergy and both feed off each others energy. The interface between these two entities occurs in Science, Industry and the Arts. 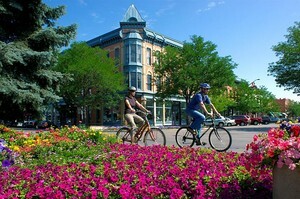 Fort Collins has more than 30 miles of bike trails/roads. In the Summers you can go biking, hiking, camping, golfing, and boating on 1,900-acre Horsetooth Reservoir, which sits just above the City. Winters are for skiing, snowshoeing, snowmobiling and partaking of the huge variety of cultural events the City has to offer. It is a 15 minute drive to the Fort Collins Loveland Airport and quick 1 hour and 30 minute drive to DIA and all that Denver has to offer. And - The Median Price of Homes For Sale in Fort Collins Colorado is $221,400! If you would like more extensive information about homes and condos for sale in Fort Collins or real estate in other nearby cities such as Loveland Timnath, Severance, Wellington, Windsor and nearby urban or rural Northern Colorado areas, please give me a call at 970-412-1657.